Halloween may only be one day a year but that doesn’t mean that video slots fans can't indulge in a little blood-letting online on every other day of the year as well. 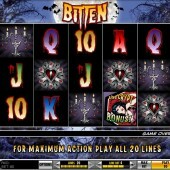 Horror-themed slots always hit the mark in my opinion, and renowned slot developer IGT’s vampire-themed game, Bitten, is a great addition to the raft of eerie slots fare. In my opinion, it’s hard to beat the slash ‘n sideburns action of werewolf-themed game, Full Moon Fortunes from Playtech, but IGT’s effort comes close. A fairly standard 5 reel, 20 payline game on first inspection, Bitten launches into action when we reach the free spins bonus round later on. But first, the reels. As well as the buxom, goth-looking vampire we get standard horror fare: a glass of blood, a candelabra, a heart-shaped locket, as well as some ghoulish 10-through-Ace symbols dripping blood. The Bitten logo acts as the game’s Wild, and substitutes for all symbols other than the Bonus Scatter. Wild wins are doubled but five Wilds pays out a juicy win of 250x your total bet, meaning a jackpot of $25,000 if you’re playing at the $1 coin bet. Three or more Bonus Scatter icons anywhere on the reels will trigger the Crypt Bonus free spins. The bonus is actually formed of a 2-part game, first requiring you to pick from a series of coffins to find out how many spins and multipliers you’ll receive. Then you’re off to the free spins screen to play out your spins. Up to 50 spins can be won, with a great multiplier of 50x applied! 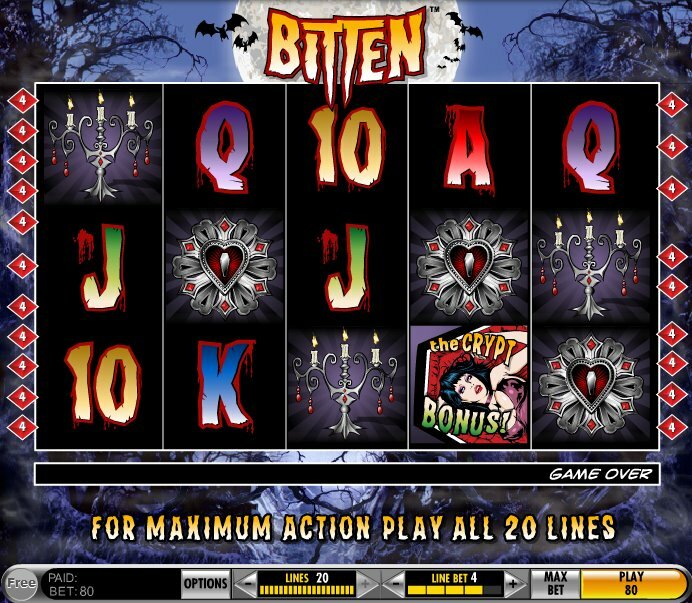 While the aforementioned slot, Full Moon Fortunes or the lush atmosphere of vampire-themed slot, Immortal Romance, from Microgaming, are more than enough for the discerning slots fan, generous free spins in Bitten should make it a must-play for vampish slots fans. Fang-tastic! (Sorry).